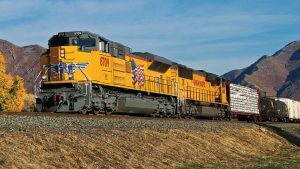 The Association of American Railroads (AAR), in reporting U.S. rail traffic for the week ending Jan. 12, 2019, noted that carloads and intermodal volume both experienced healthy increases. As well, there were gains in all carload commodity groups. 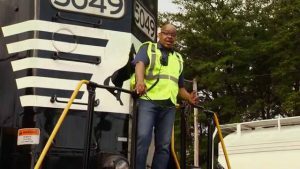 For the week, total U.S. weekly rail traffic was 555,127 carloads and intermodal units, up 8.4% compared with the same week last year. Total carloads for the week ending January 12 were 266,240 carloads, up 10.3% compared with the same week in 2018, while U.S. weekly intermodal volume was 288,887 containers and trailers, up 6.8% compared to 2018. All of the 10 carload commodity groups posted an increase compared with the same week in 2018. 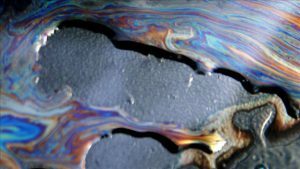 Among them were coal, up 11,218 carloads, to 87,228; metallic ores and metals, up 3,967 carloads, to 24,490; and petroleum and petroleum products, up 2,920 carloads, to 13,925. 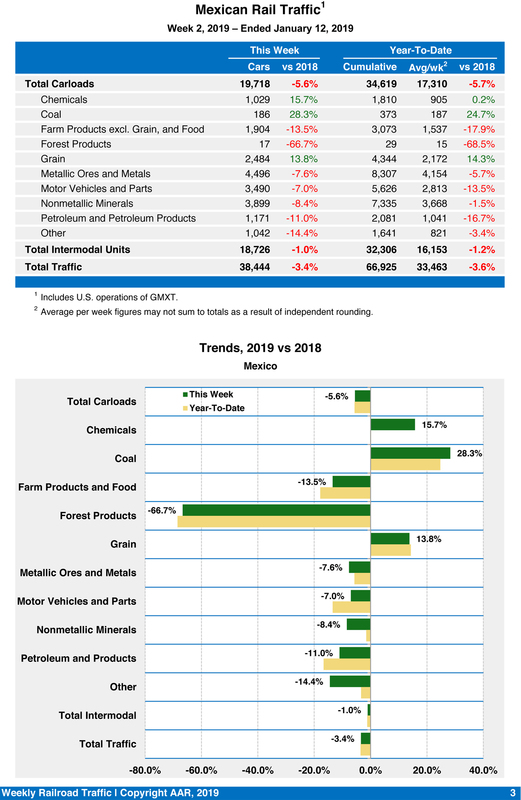 For the first two weeks of 2019, U.S. railroads reported cumulative volume of 487,999 carloads, up 8.4% from the same point last year; and 503,231 intermodal units, up 5.3% from last year. 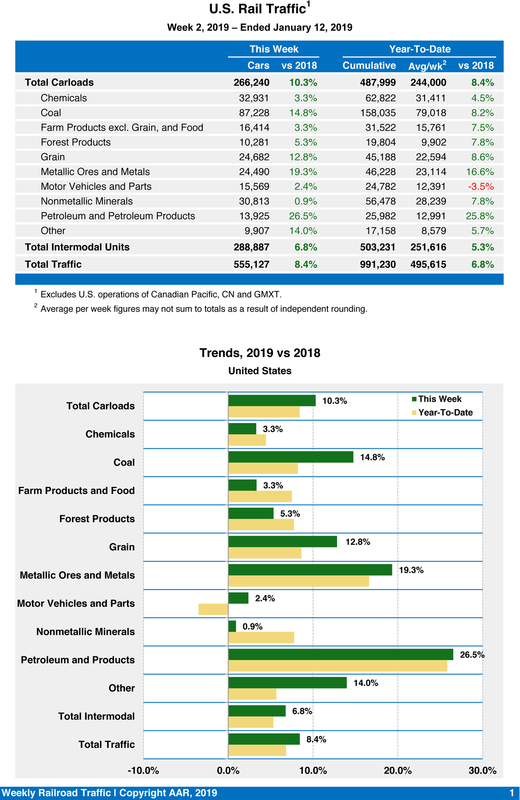 Total combined U.S. traffic for the first two weeks of 2019 was 991,230 carloads and intermodal units, an increase of 6.8% compared to last year. North American rail volume for the week ending January 12, 2019, on 12 reporting U.S., Canadian and Mexican railroads totaled 370,475 carloads, up 10% compared with the same week last year, and 379,970 intermodal units, up 7.7% compared with last year. 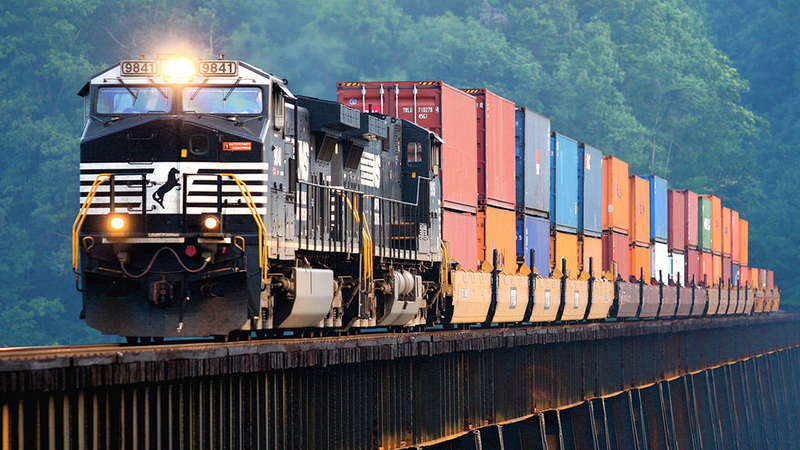 Total combined weekly rail traffic in North America was 750,445 carloads and intermodal units, up 8.8%. 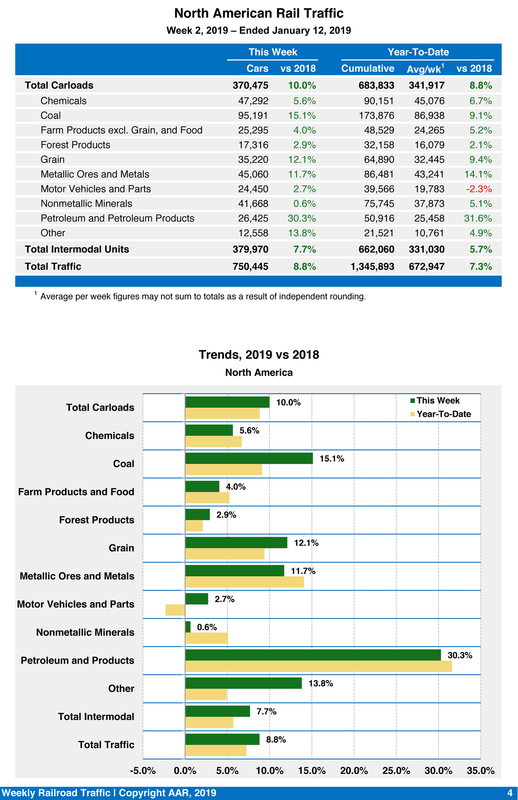 North American rail volume for the first two weeks of 2019 was 1,345,893 carloads and intermodal units, up 7.3% compared with 2018. 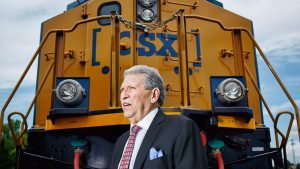 Canadian railroads reported 84,517 carloads for the week, up 13.3%, and 72,357 intermodal units, up 14.2% compared with the same week in 2018. 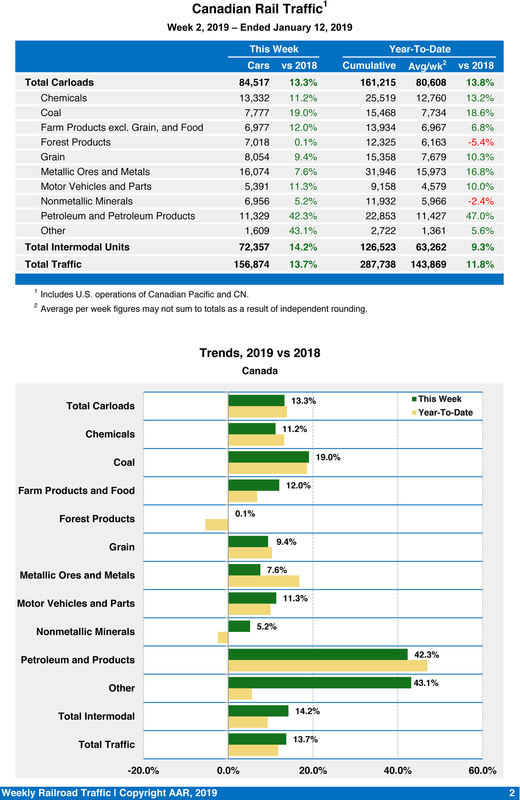 For the first two weeks of 2019, Canadian railroads reported cumulative rail traffic volume of 287,738 carloads, containers and trailers, up 11.8%. Mexican railroads reported 19,718 carloads for the week, down 5.6% compared with the same week last year, and 18,726 intermodal units, down 1%. Cumulative volume on Mexican railroads for the first two weeks of 2019 was 66,925 carloads and intermodal containers and trailers, down 3.6% from the same point last year.